1. Sift the wheat flour. 2. Add 1 tblsp turmeric powder, 2 tblsp chilli powder, ajwain and salt. Mix well. 3. Add oil and knead the flour to a roti like consistency. 4. Pressure cook the dal till 3 whistles. Remove and keep aside. 5. Heat ghee and oil in a pan. 6. Add the mustard seeds, cinnamon and cloves. 7. Once the mustard seeds splutter, add coriander leaves and green chillies. 8. Add a pinch of asafoetida. 9. Add the cooked dal and mix. 10. Add brown sugar, tamarind extract, groundnuts, cashewnuts, chilli powder and garam masala powder. 12. Add turmeric powder, pureed tomato and 3 to 4 cups of water. 13. Add salt and allow it to boil. 14. Make small/medium rotis and cut them into pieces. 15. Add these into the boiling dal and continue to boil for 10 minutes. 18. Serve hot or warm with rice. 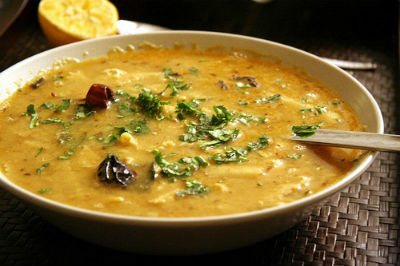 Feel free to comment or share your thoughts on this Dal Dhokadi (Spicy Dal Gravy) Recipe from Awesome Cuisine.